So two exciting announcements today!!!!! Yippee Skippee!!!!!! Julie has put so much work into converting her amazing etsy shop into a full blown Webpage and Online Shop!!!!! And check out how cool it looks!!!! It is super easy to navigate. Just click on Shop and you are taken to the new shopfront where everything is neatly divided by Collection, Designer, Manufacturer, ect. ect. ect. Perfect for whatever way you like to shop for fabric. And of course every picture is Julie's top level of photography which allows you to really get an idea for the actual color of the lines ;) I love that about Julie's store!!! So, Julie and I put our heads together and thought what better way to celebrate a GRAND OPENING than to have a GIVEAWAY!!!! That way everyone gets to Party!!!!! Whats up for grabs you ask???? 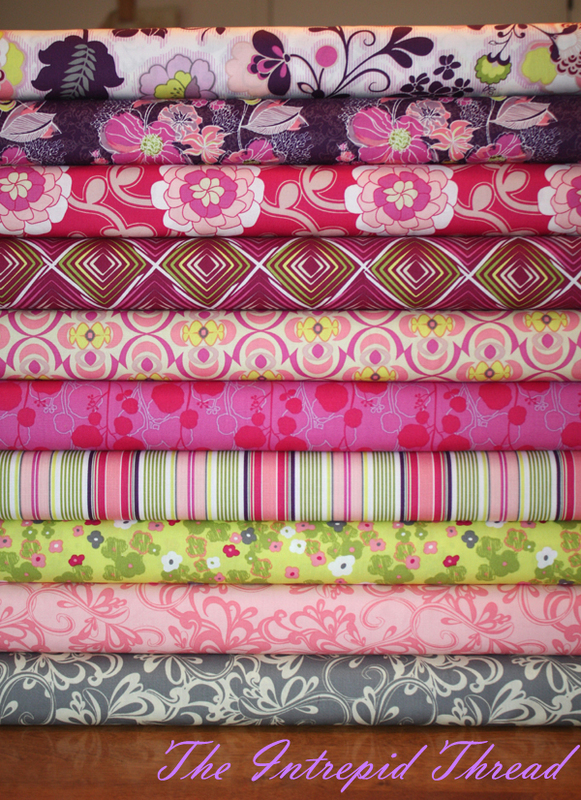 How about this totally stunning set of Fat Quarters from Pat Bravo's new Poetica line!!!!! This colorway is called Rose Ballad and I just love it!!!! To enter . . . Simply pop on over to The Intrepid Thread Shop in all of it's grand opening glory and then come back here and leave me a comment telling me your absolute favorite item in the shop!!!!! I signed up for The Intrepid Thread's newsletter. Thanks for the giveaway! Love the new shop! I'm really starting to like Hello Pilgrim - so fun! And Poetica is just beautiful. Thanks for the giveaway! I absolutely love the A Walk In The Woods - Foxlets - too cute! I get Julie's newsletter, love that shop! Lovely online shop! Congrats to Julie! My favourite print these days is the Pezzy print. Love, love, love those gorgeous colours! I signed-up for the newsletter! I love Flea Market Fancy! I already subscribe to the The Intrepid Thread newsletter. I already get her newsletter. She is wonderful! My favorite things in the shop are from the Summersville collection. Unfortunately, they are all stocked out. My current favorite in the hop would be the fat quarter bundle of Hello Pilgrim. My favorite item right now is the Morroccan Mirage - Oasis in Marrakech. Thanks for the chance to win! I am dreaming of a butterfly quilt, so I was excited when I saw the Cocoon fabric collection that is coming in April... I will have to check back in for that next month! I love the Verona collection, but I would buy a Woodland Tails Charm pack to make a baby quilt! How can I possibly choose? There are LOTS of collections and fabrics that I really love in the Intrepid Thread's new shop, but I will have to go with the Pezzy Prints as my current fave. I really need to add the whole collection to my stash!! I am subscribed to the Intrepid Thread's newsletter - thanks for the extra chance to win! I love the pezzy prints. I'm REALLY excited for Summerville to get here too. I love the Verona - Half Yard Bundle in Grey! Julie's new site looks fabulous! Right now I'm loving the Groovin' line, coming in March. I think Poetica might be my favorite as well in the blue purple range. I really love the Power Pop collection. It seems like it is a gorgeous line. I love the fabrics of the Denyse Schmidt collection! Lovin' the Pezzy prints still! I really need to order those! I already receive Julie's newsletter. Her new website is gorgeous! I know how hard she has been working on it and her hard work has paid off. I love the Hello Pilgrim fabric. Thanks for the great giveaway and Congrats on the new website. I will be receiving the newsletter! I love Woodland Tails by Riley Blake. I love the Karavan collection especially in peacock. Thanks for the chance to win! Ooh! I'm a flutter-- what a gret re-do to Intrepid Threads! My faves are: Flea Market Fancy (limited amount to pre-order, coming in March) Bouquet in gold, and Posie in Turquoise (aqua? ), And...Julie's special fat quarter bundle called From Cream to Curry-- love it! I have signed up for the newsletter, thanks. I really love the Elements Half Yard Bundle in Garden. Great colours. I get the intrepid thread newsletter already! Oops, I was supposed to tell you what I liked in that last comment. I do get Julie's newsletter, and I am so excited for Flea Market Fancy. I have big plans for it. I subscribe to The Intrepid Thread... is that the same as the newsletter? Some Apple of My Eye, please. Would make some darling little girl outfits. I really like Apple of My Eye by Riley Blake. Love the colors...very fresh. I love all of Lizzie House's designs. :) Thanks for the chance, and the new website is lovely. I already subscribe to the intrepid thread. I love Intrepid Thread! And the new website is awesome! I especially love the bundles she creates and my current crush is the Cosmos Azure bundle. Visited The Intrepid Thread and saw lots of wonderful fabrics!! I can't wait to see what Joy and Quilt Blocks are going to offer - exciting!!! Ooh the new website looks great!! I love all the Flea Market Fancy! I signed up for the Intrepid Threads newsletter! Cosmos half yard bundle in Azure. Yummy! My favorite item is Power Pop - Half Yard Bundle in Cornflower. The new website looks wonderful. Thanks for the opportunity to enter your great giveaway. Love the new website. It was very easy to find things. I am loving the Apple of my Eye line coming soon. It looks scrumptious. OK I hate it when you make me choose!! LOL I love them all, I will say my curiosity is peaqued by Nightshade... hhhmmmm I think I might have a new must have! I can't wait to see it!! I just love the new Cosmos line. I totally love the Cosmos - Empyrean Azure material I think it looks like baby fish and its so cool. Wow! Julie's shop looks lovely! I really love the Peak Hour panel in white. My son would love it! :) Thanks for the chance to win! I think the bundles of Cosmos are soooooo delightful over at the Intrepid Thread especially the Azure colorway. I love Poetica too. Thanks for the chance to win some. 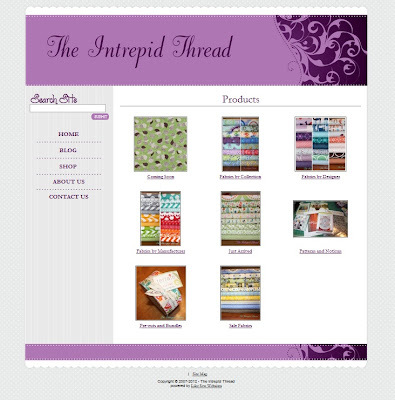 I am on the mailing list for The Intrepid Thread newsletter - bookmarked her new shop too! I signed up for the newsletter, and I love the Cosmos collection. Contests to Julie and many wishes for continued success! I love all of the walk in the woods foxes prints. So cute! I already get her newsletter. Good luck everyone! The new design is much easier to navigate. I really like the Moda Summersville fabric line. The new Cosmos bundles are dreamy! Congrats Intrepid Thread! I hope your shop is a success. And thanks for offering fat quarters! I'm always annoyed when the minimum cut is one yard. A Walk in the Woods is one of my favorites! I like the Flower Pop half yard bundle, among many others! Thanks for the chance at your giveaway. I already get the newsletter, thanks for the second chance. I really like the Verona Rouge bundles. My favorite is the purple fat quarter bundle. I saw it on her blog before. I know its not in yet - but I am really looking forward to Cherry Christmas! I love the Tula Pink collection with the frogs in it. It's very unusual and very fun. congrats on your new website - it is very clean and easy to navigate in. At some point in time you need to add a design board or wishlist, someplace where we could see the fabrics together. I think I get your newsletter already - but signed up again just in case - would not want to miss out on a chance for that beatiful poetica. I am craving the Cosmos line...I signed up for the newsletter...I can already see that I will be spending some time and money in this shop. I already receive Intrepid Threads newsletter. Love her shop. I love the pezzy prints! Thanks for the giveaway. I absolutely love Poetica, so I hope I win!! I really love the way she has organized the shop with the different ways you can search for the fabrics you want. i receive the newsletter, thanks! My favorite in the shop is the full half yard collection of Cosmos. i'm going with summersville-avenue in charcoal-can't wait! thanks for the giveaway! Love Intrepid Thread! I have been into making baby items and the Kellie Wulfson (Don't Look Now) Peak Hour fabrics are adorable. I will have to pick some up from Julie! My favorite is the Verona bundle in Grey. Beautiful colors! Oooh! What a pretty set of fat quarters. I'm looking forward to the fancy flea market print & I'm loving the Verona stripe in teal. The shop looks great! I have signed up for the newsletter. Can't wait to see all the new stuff coming in! I love the Pezzy prints! I love Pezzy Prints--all colors. I have to say that I really like the way the shopping cart pops up in the corner on the screen. It is large, but not annoying large and it gives me an idea of what I am about to spend. Yes, I bought some fabric. ;-) I love that Poetica line. So cheerful and Pat Bravo's fabric just feels good! Thanks for getting the word out for Julie. She is the best. I guess Ty Pennington's Medallions in Teal. I like a lot of his designs. Just stumbled on to the Apple of my eye collection by the Quilted Fish....so cute! i like the fruit slice fruit flavors. I am really wanting some of those Pure Element solids. Yum! I already get the newsletter and love it! My favorite at this moment is Cosmos or Hello Pilgrim or maybe Nature Elements. I think I may need some of each. Pezzy Prints are a must have for my stash this year! I love Intrepid's new site. I love the Peak Hour fabric!!!! super cute! LOVE "WALK IN THE WOODS"! THANKS TO YOU+INTREPID THREAD FOR A GRAND GIVEAWAY! Great layout for the shop! My favorite fabric this week is woodland tails. I signed up for Intrepid Thread's newsletter! Thanks again! I like the new line of A walk in the Woods... it's so cute! I receive the Intrepid Threads Newsletter too. thanks for the chance! Love Julie's new site! So hard to choose, but my absolute favorite is Piccadilly Circle!!! Desert Daydreams - Coffee Beans in Turquoise is so happy looking! Signed up for Intrepid Threads Newsletter! Thanks for the chance. I love the Karavan Fat Quarter Bundle in Peacock! The color is one of my favorites! I really like the Verona fabrics at The Intrepid Thread. I'm signed up for their newsletter. Thanks for the giveaway chance! I love the Hello Pilgrim Butterfly fabric in aqua! So bright and lovely. I've signed up for the newsletter, too! Thanks! Cosmos--Allusions in Violet my fav all the way. Signed up for the newsletter!!! Fingers crossed! My favorite is the Verona bundles she has put together - so pretty! I already subscribe to The Interpid Thread's newsletter. That sneak peak sure looks great. I wonder who will end up with that fine piece of workmanship! 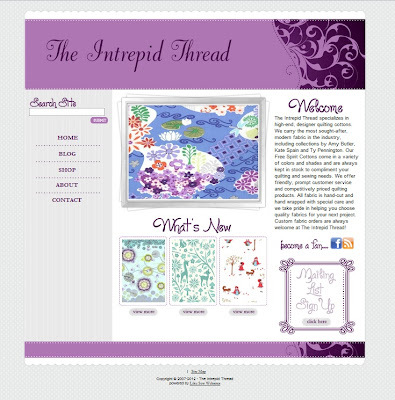 I am already signed up for Intrepid Thread Newsletter!! I signed up for the newsletter! What a great celebrations, Thank you! My favorite would have to be "Apple of my eye", all of it. LOL. Thanks for the opportunity! I love the new shop! A Hello Pilgram bundle would be lovely! I love Hello Pilgrim! thanks! I'm really hoping to get some verona soon. Wow love the new shop. I love fat quarter bundles so it is good to see those. I especially like the Desert Daydreams complete collection. Thanks for the chance to win beautiful fabric. We have eight babies being born to friends and family this summer so I think I'd turn those beauties into a baby quilt. FMF is my fav, of course! My favorite item, (Summerlove - Daydreaming in Ocean) isn't in the shop yet - but thanks to the Coming Soon feature, I can start planning now! I love Poetica "Sweet Melody"
My favorite thing from Intrepid Thread is Flea Market Fancy, soon to be available again! Everything looks wonderful! I really like the Lilac to Purple FQ Bundle! I love the Verona, Walk in the Woods and Poetica lines! It just has to be the Walk in the Woods collection, love the colours. I receive The Intrepid Thread's newsletter! Thanks for the chance to win! I reall need or want some Poetica! I already get the Intrepid Thread's newsletter. This is a fab. giveaway.